The survivors of the Bhopal gas disaster never want anyone else to suffer the way they have. Union Carbide Corporation must cease to abscond from justice and answer, through its designated official, charges of manslaughter and grievous assault in the criminal case pending before the Bhopal District Court. Union Carbide and Dow Chemical must pay additional compensation as sought by the Government of India’s Curative Petition in the Supreme Court of India to pay for actual number of deaths and injuries caused by the gas disaster. Union Carbide and Dow Chemical must clean up of contaminated soil and ground water in and around the abandoned Union Carbide factory and pay for health monitoring of the affected population. Dow Chemical must respond to summons issued by the Bhopal District Court to appear before March 14, 2015 in the ongoing criminal case. Acknowledge and express regret for financing, through its EXIM Bank, the construction of the hazardously designed plant that caused the world’s worst industrial disaster. Acknowledge and express regret for rejecting requests by the Indian government for extradition of Warren Anderson, prime accused in the criminal case on the disaster. Extradite John McDonald, Secretary to answer charges of manslaughter and grievous assault in the Bhopal District Court. In line with promises made by Mr. Ananth Kumar, Minister Chemicals & Fertilizers on November 14, 2014, pay additional compensation of Rs. One hundred thousand to those claimants who have been earlier paid only Rs. 25 thousand as compensation and were wrongfully denied additional compensation. In line with promises made by Mr. Ananth Kumar, Minister Chemicals & Fertilizers on November 14, 2014, revise the figures of Bhopal disaster related death and injury as presented in the Curative Petition before the Supreme Court of India on the basis of scientific facts and seek urgent hearing on the petition. 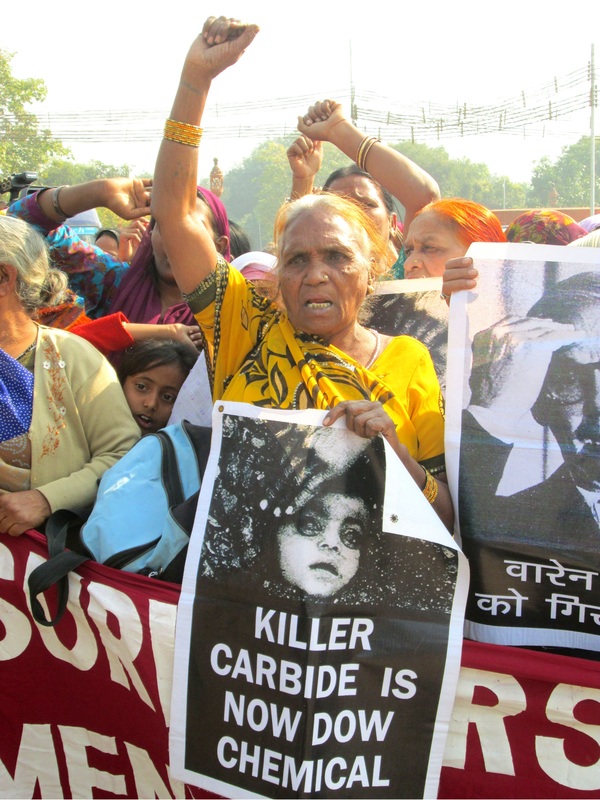 Intervene in the US Federal Court in support of Bhopal victims of ground-water contamination seeking clean up of the Union Carbide factory area and its surroundings. Not allow Dow Chemical to make any investments in this country, directly or indirectly, till it accepts Union Carbide’s liabilities in Bhopal. Ensure that a comprehensive scientific assessment of the nature, depth and spread of contamination is carried out by a competent national or international agency for clean up and assessment of evironmental damage caused byUnion Carbide / Dow Chemical.. Ensure that the prosecution agency, Central Bureau of Investigation (CBI), makes the authorized representative of Union Carbide Corporation, Secretary, John McDonald appear before the Bhopal District Court in the pending criminal case on the disaster. Set up a special prosecution cell in the CBI and arrange for fast track courts for speedy prosecution of Keshub Mahindra and other Indian accused under enhanced criminal charges. Ensure that the Bhopal Memorial Hospital has full facilities for treatment of all diseases known to be associated with exposure to Union Carbide’s poisons. Ensure that the National Institute for Research in Environmental Health (NIREH) provides treatment protocols specific to exposure related health problems and carries out medical research that benefits the gas victims and those exposed to contaminated ground -water. Set up an Empowered Commission on Bhopal with adequate funds, authority and participation of survivors’ representatives for planning, implementation and monitoring medical, social, economic and environmental rehabilitation. Declare December 3 as a Day of Industrial Safety and include Bhopal Gas disaster in school and college text-books. Intervene in the US Federal Court as the owner of the land of the Union Carbide factory site in support of Bhopal victims of ground water contamination seeking clean up of the factory area and its surrounding. Ensure that all hospitals run by the Bhopal Gas Tragedy Relief and Rehabilitation Department are adequately staffed, stock quality medicines, use standardized treatment protocols and offer free treatment to people exposed to contaminated ground water. Ensure that every person known to be disabled or turned destitute including widows as a result of the disaster receives a lifelong monthly pension of at least Rs. 1000/- as social support. Start providing rehabilitation and medical care to all children of gas and contaminated water exposed parents with congenital disabilities. Punish corrupt officials involved in misappropriation of Rs. 18 Crores in the work of economic rehabilitation. Justice? Corporate Accountability? Environmental Justice? Globalization? Human Rights? Environment? Safety and Health? The Rule of Law? Labor Rights? Occupational Health? The Right to Know? Poverty and Hunger? The rights of women and children? Human Life? For the past two decades, some of the poorest people on earth, sick, living on the edge of starvation, illiterate, without funds, powerful friends or political influence, have found themselves fighting one of the world’s biggest and richest corporations, backed by the government, military, and, it often seems, even the judiciary of the world’s most powerful nation.The corporation and its allies have it all – wealth, power, political influence, lawyers, PR companies, the ear of presidents and prime ministers, the power to bend policy to their will, and manipulate the courts and laws of two countries to avoid justice in either. The ‘nothing people’ have literally nothing. If thirty-five thousand of them clubbed together they could not afford one American attorney. Their efforts to obtain justice have been thwarted in every way possible by the corporation that killed their families and ruined their lives. Naively trusting that the Indian government would come to their rescue, they were instead abandoned, sold down the river by politicians and judges, obstructed and swindled by corrupt bureaucrats, cheated by unscrupulous quacks and not infrequently beaten by their own police for daring to complain. The campaign itself has been conducted on the most unequal terms. On one side, multi-million dollar budgets and the best professional brains money can buy – armies of corporate lawyers, political lobbyists, spindoctors and media manipulators (including Burson Marstellar, the world’s biggest PR company) – on the other a handful of unpaid volunteers often without money for stamps, photocopying, telephone bills, or travel. It’s David against an army of Goliaths. Yet the survivors of Bhopal not only refuse to give up, they have led an unbending fight for justice. Not only is this fight being won, it has the potential to realize a safer and healthier world for everybody. Bhopal is the corporate crime par excellance – quite literally. Long before the Enron or Worldcom scandals, the CEO of Union Carbide, Warren Anderson – and the Union Carbide Corporation itself – were charged withculpable homicide in India after Bhopal. Both the corporation and its former CEO are considered “fugitives from justice” by the Indian Government, and Warren Anderson lived as a fugitive, in hiding, for more than a decade. (1) They remain fugitives today.Bhopal began as a classic instance of corporate double-standards: Union Carbide was obliged to install state-of-the-art technology in Bhopal, but instead used inferior and unproven equipment and employed lax operating procedures and maintenance and safety standards to those used in its US ‘sister-plant’. The motive was not simply profit, but also control: the company saved $8 million, and through this deliberate under-investment managed to retain a majority share of its Indian subsidiary. (2) On “THAT NIGHT,” none of the plant’s safety systems – six in all – were operational, and the plant siren had been turned off.Following the massacre, Bhopal became a test case for corporate accountability. While the world anticipated an exemplary punishment for Carbide – such as ownership of the $10 billion corporation’s assets being transferred to the survivors – US courts allowed Carbide to take the case to India, far away from its asset base. There, the company used a strategy of delay, denial and disinformation. It contested the legitimacy of courts it had asked to be tried before. It denied it was a multinational. It claimed the gas was not ultra-hazardous. It blamed an unnamed saboteur. It appealed court orders for humanitarian relief, while professing its concern for the victims. The strategy worked. Once Union Carbide and the government of India had hatched an out-of-court settlement, hazardous enterprises everywhere had the go-ahead to carry on business as usual, safe in the knowledge that the price for industrial massacre had been set at just 48 cents a share. Today, they’re not so sure. Setting a legal precedent, in March 2004 the Second Circuit Court of Appeals – second only to the US Supreme Court – ruled that Union Carbide can be held accountable in US courts for environmental cleanup and medical monitoring costs in Bhopal, a world away. Dow has been summoned to appear in Bhopal to explain why it continues to harbor its subsidiary, a fugitive, from trial, and its Indian assets risk seizure. And Dow-Carbide has the dubious honor of becoming the first corporation ever indicted for crimes against human rights by Amnesty International. Bhopal remains a test case for corporate accountability: one it’s possible for us to win, and which we can’t afford to lose. Is “$500 good enough for an Indian?” Dow apparently thinks so, and its public relations spokeswoman even said so, explaining why the company refused to consider further compensation for the victims of Bhopal. The plant was built in the midst of an impoverished sea of people, many of them minority (Muslim), and many of them illiterate, lacking political power. It was these people who suffered the worst of the gas disaster – the chemical violence which took their health and their loved ones often took their livelihoods as well, leaving them too sick or weak to earn a living. Bhopal is a catalogue of double standards. In Bhopal, the complete failure of plant safety systems meant thousands were gassed to death. At Union Carbide’s sister plant in Institute, West Virginia, safety systems were not only functional, they were computerized. In Bhopal, Carbide refused to plan with local authorities in case of disaster, and in the event claimed the ultra-hazardous methyl isocyanate was no more dangerous than tear gas. At Institute, local planning and disaster scenarios were in place. In Bhopal, MIC was stored in quantities that dwarfed any other plant in the world – more than 60 tons, far exceeding Institute and the EU’s recommended guidelines. The settlement reached between Union Carbide and the Indian Government awarded an average of $500 in compensation to the victims of Bhopal, or 7 cents per day – the cost of a cup of tea. Alaskan sea otters injured in the Exxon Valdez disaster were kept alive with airlifted lobster at a cost per animal of $500 per day. Following its purchase of Union Carbide, Dow set aside $2.2 billion to resolve Carbide’s US asbestos liabilities, but has not acted to stop the ongoing contamination of tens of thousands in Bhopal – a grim fact many consider inhumane, unjust, and immoral. “In its timing and in the composition of the principal actors, Bhopal is a curtain raiser to the sordid drama of Globalisation. Bhopal is a window to what lies at the end of Globalisation.” – Satinath Sarangi, Genoa, July 2001. Bhopal epitomizes the utter failure of international agencies and legal systems to meet the challenges of a globalized world, where the protection of health, human rights and the environment depends upon the possibility of holding corporations fully accountable for their crimes.The disaster in Bhopal was a product of today’s system of globalization, and a direct consequence of double standards in safety, the routine violation of worker’s rights, a callous disregard for the lives of people from poor, marginalized communities and a calculus of environmental harm, all framed within an inequitable yet complicit relationship between governments and Big Business.Dow executives and Board members have continued to insist that India’s ‘polluter pays’ laws do not apply, that they have no responsibilities in Bhopal, and that they intend to do nothing there to stem the contamination or protect human health. Both the accident – a product of Union Carbide’s cost cutting and double-standards – and the company’s behavior since then represent the worst abuses of globalization and corporate power. 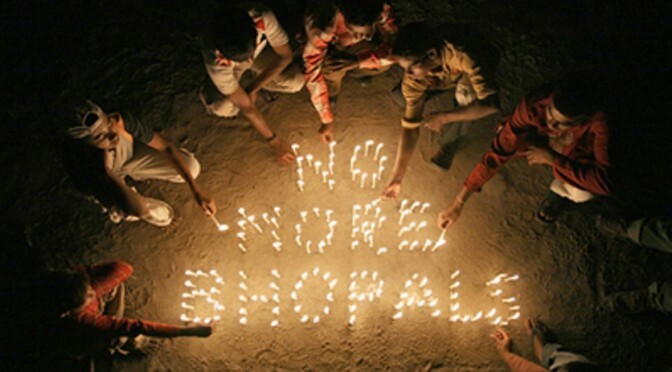 Bhopal was not only a disaster, but was also, and continues to be, a fundamental violation of human rights. Amnesty International cites Bhopal – and Dow-Carbide – as the leading example of the corporate violation of human rights: “The Bhopal case illustrates how companies evade their human rights responsibilities and underlines the need to establish a universal human rights framework that can be applied to companies directly.” In its 2004 report on the Bhopal disaster, “Clouds of Injustice”, Amnesty writes that “Thousands of people in Bhopal were denied their right to life, and tens of thousands of people have had their right to health undermined. Those struggling for justice and the right to a remedy in Bhopal have been frustrated in their efforts. 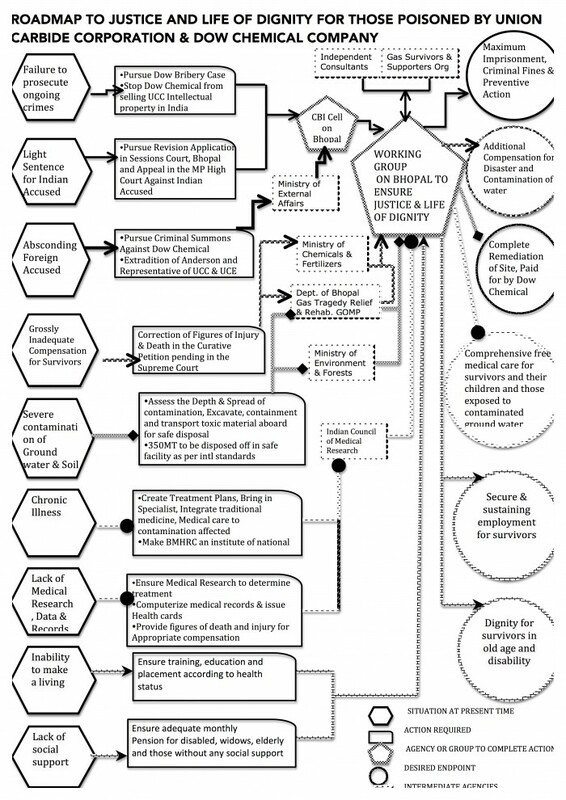 Thousands of poor families have suffered illness and bereavement, further impairing their ability to realize their right to a decent standard of living. cropland have been left sterile and desert-like by chemical seepage from Union Carbide’s “solar evaporation ponds.” Children play in the wasteland despite the danger.In 1999, testing near the site revealed mercury at levels between 20,000 and 6 million times those expected. Carcinogenic and mutagenic chemicals have also poisoned the water supply; trichloroethene, a chemical that has been shown to impair fetal development, was found at levels 50 times higher than EPA safety limits. Testing published in a 2002 report revealed poisons such as 1,3,5 trichlorobenzene, dichloromethane, chloroform, lead and mercury in the breast milk of nursing women.Although “polluters pay” is the law in India, Dow refutes the principle and has adamantly refused any responsibility for a cleanup. (3) Until Dow-Carbide cleans up its contamination in Bhopal, it will continue to spread, leach, and poison everything in its path, extending the “dead zone” in Bhopal. United States. Dow Chemical, for example, reported 2562 accidents between 1990 and 2003, and the US Environmental Protection Agency (EPA) has identified 112 facilities where a Bhopal-like accident or terrorist attack would endanger the lives of more than a million people (see where they are).Even without an accident, so many hazardous chemicals are released that the EPA set up a reporting system called the Toxics Release Inventory (TRI). In 2003, according to the TRI, releases of almost 650 toxic chemicals were reported, totaling more than 4.44 billion pounds. Some of those releases may have been in your backyard.We all remain at risk because – even in the wake of Bhopal – the chemical industry has never felt the sting of accountability. Two decades later, we’re all living in Bhopal. Showing no shame, Dow has even sued nonviolent Bhopal protestors for daring to rally outside its Indian headquarters. and even Carbide management in the US about the dangers at the Bhopal plant: the result was suppression of the union, the sacking of three leaders and the continued de-skilling and downsizing of staffing levels under a savage cost-cutting program orchestrated by the US parent. None of the plant’s safety systems functioned on the night of the disaster, a spectacular failure. Yet Carbide swiftly blamed a worker for sabotage (Dow and Carbide still make the claim today, and still refuse to name him).Unions have been at the forefront of the Bhopal campaign from the start. In a rehabilitation scheme, gas-affected women were given stationary work by the state government, but paid so poorly they refused it as an insult. 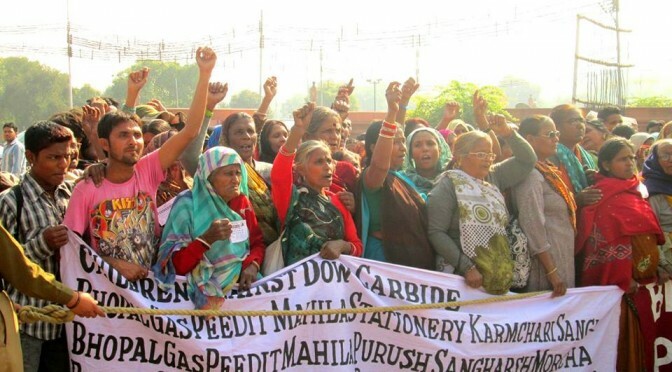 In 1987 they formed the BGPMSKS, or Bhopal Gas Affected Women Stationery Employees Union, and chanted their demands from dawn to dusk in front of the Chief Minister’s office. Unsatisfied, on June 1st, 1989, more than 100 women, many with children in their arms, marched 750 kilometers to New Delhi to petition the Prime Minister. Many sold everything to join the march, and a few suffered miscarriages. Even after returning, it took months of struggle before some of their demands were met.The women survivors of BGPMSKS are the core of the International Campaign for Justice in Bhopal. The President of BGPMSKS, Rashida Bee, and its Secretary Champa Devi Shukla, were awarded the Goldman Environmental Prize in 2004 for their leadership of the campaign. “When Governments and Corporations do not live up to their obligations, it is only solidarity among workers, trade unions and people’s groups that can carry us forward,” Rashida told the annual gathering of PACE employees in Clare, Michigan, in 2003. Long before the Union Carbide plant turned Bhopal into a gas chamber, workers at the plant paid the ultimate price for Carbide’s decision to cut corners on safety for the sake of profit. On December 25, 1981, a leak of phosgene killed one worker, Ashraf Khan, at the plant and severely injured two others. On January 9, 1982, twenty five workers were hospitalized as a result of another leak at the plant. During the “safety week” proposed by management to address worker grievances about the Bhopal facility, repeated incidents of such toxic leakage took place and workers took the opportunity to complain directly to the American management officials present. In the wake of these incidents, workers at the plant demanded hazardous duty pay scales commensurate with the fact that they were required to handle hazardous substances. These requests were denied. Bhopal is a stark reminder that occupational health issues can quickly become public health catastrophes, particularly in the petrochemical industry. Twenty years later, many of Union Carbide’s former workers in Bhopal are still fighting the company for adequate compensation and have requested access to the results of blood testing and examinations that Union Carbide conducted on its employees prior to the disaster. These requests have also been denied. By contrast, the occupational health community has been supportive. In November, 2004, two gas survivors and leaders of the International Campaign for Justice in Bhopal, Rashida Bee and Champa Devi Shukla, were awarded the Occupational Health & Safety Award by the American Public Health Association. Bhopal marked the birth of the modern right-to-know movement. Carbide management declined to inform local communities about the hazards in the plant or how to protect themselves and had no emergency planning or evacuation plan. The result was thousands of avoidable deaths. As a consequence of Bhopal, ‘right-to-know’ legislation was enacted in the US and elsewhere. Twenty years after the disaster, more than 120,000 people in Bhopal are still ill. (5) Their breathless bodies no longer able to push handcarts and lift heavy loads, thousands have fallen into destitution and their families have learned the lessons of the abyss, binding cloths round their middles to give an illusion of fullness, giving children unable to sleep from hunger water to fill their empty bellies. Trapped in a cycle of poverty and desperation, their children – often ill themselves – have little hope for a better future. 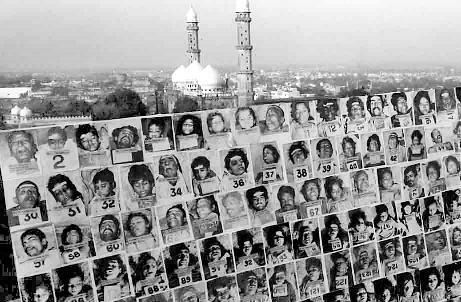 Amnesty International estimates that 22,000 people were gassed to death in Bhopal, including thousands of women and children. Today 30 people die each month from the effects of their exposure, and the death toll from Dow-Carbide’s chemical violence continues to rise. (6) More than 120,000 people are critically ill and in desperate need of medical care, and thousands of children have been born with birth defects, learning disabilities, and stunted growth. Even the breast milk of nursing mothers has been contaminated, and the chemical terror won’t end until Dow cleans up its killing fields. 4 Cited in The New York Times. 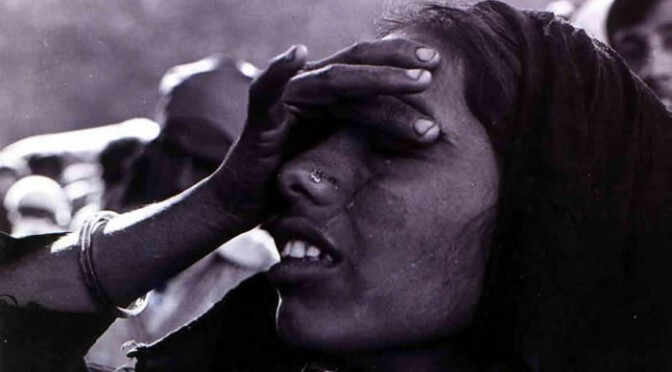 “Bhopal Seethes, Pained and Poor 18 Years Later.” Amy Waldman, September 21, 2002. This refusal is inexplicable, as ‘trade secret’ provisions do not, in fact, apply. This was revealed in a Chemical Manufacturers Association (CMA) meeting shortly after the Bhopal disaster, at which Union Carbide representatives were present: “Trade secret protections under the federal standard extend only to chemical identity, not hazard information. …Chemical identity information which is a trade secret is made available to those who have a legitimate need for it, such as treating physicians.” See page 34 of the CMA Executive Committee Meeting Agenda, January 28, 1985, available at: http://www.chemicalindustryarchives.org/search/pdfs/cma/19850128_00000473.pdf. 5 The Washington Post. “India Seeks to Reduce Charge Facing Ex-Union Carbide Boss.” Rama Lakshmi, July 8, 2002. According to The International Medical Commission, Bhopal, “it is our opinion that, if properly defined, categories of permanent damage, partial or total disability, could include about 200,000 survivors.” International Perspectives in Public Health, 1996, Volumes 11 and 12, p. 27. 6 According to The Centre for Rehabilitation Studies’ (an office of the Madhya Pradesh government’s Bhopal Gas Tragedy Relief and Rehabilitation Dept.) 1998 Annual Report, the mortality rate among the exposed community in 1997 was 6.70/1000, whereas in the unexposed community it was 5.37/1000, producing a figure of 665 deaths above the mortality rate in the exposed community – or approximately 50 gas related deaths per month. No official figures exist for subsequent years. Further, according to a 1987 ICMR report, the mortality rate in the exposed community was 9.98/100 and in the unexposed community was 6.03/1000, meaning approximately 150 gas related deaths per month in 1986. Assuming a steady ratio of depreciation in mortality of 6% per year, in 2003 there were therefore over 30 deaths per month due to gas exposure. However, it is worth noting that six monthly morbidity studies conducted by the ICMR between 1987-1991 show that the number of people with gas related symptoms actually increased in that period.